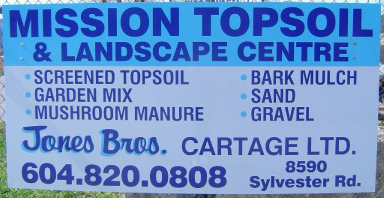 Our Mission Topsoil and Landscape Centre is located on Sylvester Road one block north of the Lougheed Hwy. At this location we process our soil blends for sale to the public. We also have in stock, sand and gravel, mulches and manures. Our yard is open 6 days a week for loading of small pickup trucks and utility trailers as well as large dump trucks. 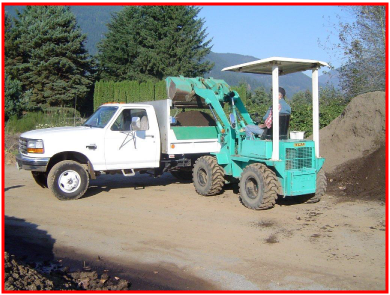 Deliveries are done by large or small dump trucks to the Mission, Abbotsford, Maple Ridge and surrounding areas. Delivery charges will vary with load size and delivery location. Along with our affiliated partner Jones Bros. Cartage Ltd. we are able to offer a wide range of construction and landscaping products, excavating and trucking services. For more information regarding our products, services and delivery fees please feel free to contact us. Payment can be made by cash or cheque. At this time we do not accept bank cards or credit cards. For product loading please call ahead.